There’s so much happening I’m not sure I can keep up with it all! First off I’m performing tomorrow night at the Bluebird! ​I’m excited to give you my Beth Nielsen Chapman update to start your week off! 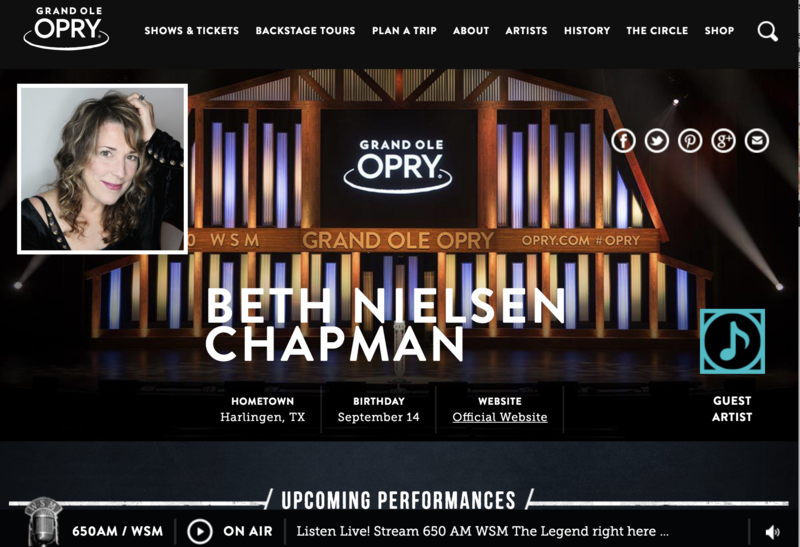 In addition, here is a story in Music Row announcing my Opry debut.!!! ​The story was also featured in Music Row’s email blast! I had such fun performing at the Country Music Hall of Fame on Saturday, as part of Hall of Fame Songwriter Series. It was a full house and an fantastic audience and my lovely son Ernest even joined me on Sand and Water. performance at the Grand Ole Opry! SESAC on Wednesday at 4 pm will host an album release party for “Hearts Of Glass” and I’ll be joined by my producer on the project Sam Ashworth and the incredible Ruby Amanfu! WMOT there will be a live broadcast at the Nashville Palace on Friday at noon! And that’s just this week!! Next week I head into the sky and will send you all the details on that adventure soon! Your song “Down on my Knees”“featured on “The Voice!” Nice surprise! Hello, I’m Michael Holloway from South Australia. Congratations on your album release for “Hearts Of Glass” which I bought on Amazon.com and love. I wish you would tour Australia as I would love to see you perform live, and I would love to attend one of your teaching workshops.